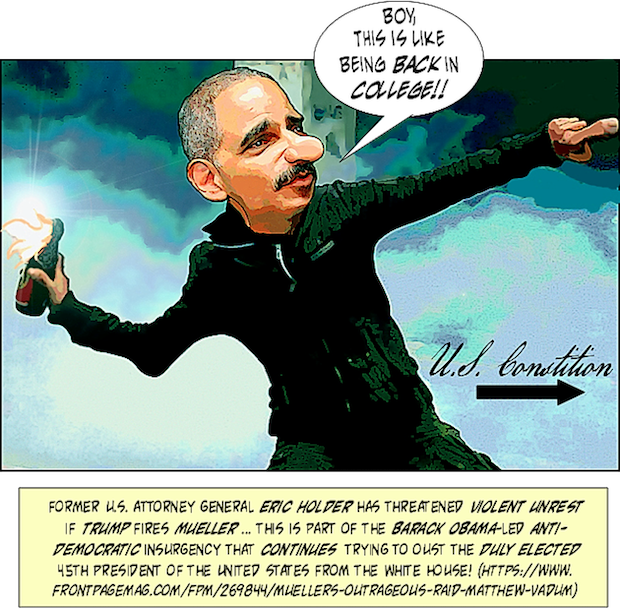 Former AG Eric Holder: Just When You Thought He Was Gone, He’s Back | What Did You Say? Oh my goodness. Obama has been spouting off, talking about the lack of scandals during his administration. Perhaps Barry has a case of early onset dementia? Barack Obama’s super-secret speech at MIT last month — the one that was so far off the record that no one was permitted to stream it, or talk about it to the press, or comment about it on social media — contained nothing that remotely justified such hugger-mugger. With hundreds in the audience, of course the speech was surreptitiously recorded and leaked. And he declared that his administration had been scandal-free. Obama, his former aides, and his media devotees have been making this claim for years. With so much repetition, it has become a popular urban legend. But popularity isn’t truth. Jacoby goes on to list the Obama era scandals, and first on the list is — ta duh! — “Operation Fast and Furious”! In a botched “gunwalking” sting, the Justice Department allowed thousands of guns to be sold to suspected smugglers, in the hope of tracing them to Mexican drug cartels. But the Obama administration lost track of the weapons, many of which later turned up at crime scenes in which scores of people were murdered. Among the dead: US Border Patrol Agent Brian Terry, killed by drug gangsters in 2010. Compounding the scandal was Attorney General Eric Holder’s refusal to turn over documents relating to the operation, a refusal for which he was held in contempt of Congress. Yep. That scandal with Eric Holder right in the middle of it. And we should all remember the DOJ case against the New Black Panther party, accused of thuggery and voter intimidation. Holder went easy on them and refused to prosecute, accusing Republicans of racism. And who can forget Holder began his tenure with the ever-popular “Nation of Cowards” speech? Though this nation has proudly thought of itself as an ethnic melting pot, in things racial we have always been and continue to be, in too many ways, essentially a nation of cowards. But what would you expect from a former college radical? Obama was a member of the pot-smoking “Choom gang” — which might explain why he has no memory of any scandals during his tenure — and his buddy Eric H participated in his own anti-establishment, anarchist revelry. And this is the guy BHO chose to be the United States Attorney General? Sheesh. Even now Holder refuses to just go away and has been piping up and tweeting that Trump better not fire Mueller! Well, to ensure a fair and accurate accounting, it should be noted that, unlike Elvis, most of Obama’s boys (and girls) never left the building. 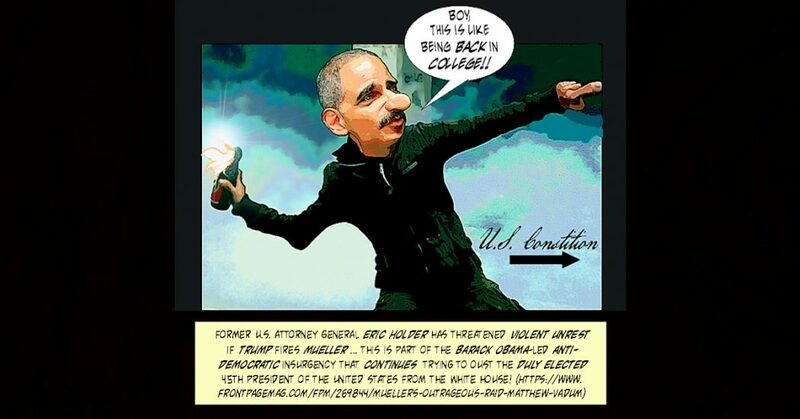 Eric (the Red) Holder, of course, relocated to the People’s Republic of California, the only state in the U.S. that recognizes no extradition treaty with the federal government. But even the California Assembly, otherwise known as the Golden State Politburo, eventually gave Holder the boot, although the Senate retained his so-called “valuable services” apparently for the sole purpose of ramrodding Cali’s ongoing legal subversion against the Trump administration. I, for one, wish that Obama and gang would leave “the building” and stay gone. Maybe they could all accompany Rep. Hank Johnson to Guam? If it tips over Barry’s Water Dogs will have the time of their lives! A Holder-less, Obama-less America would be a big win.